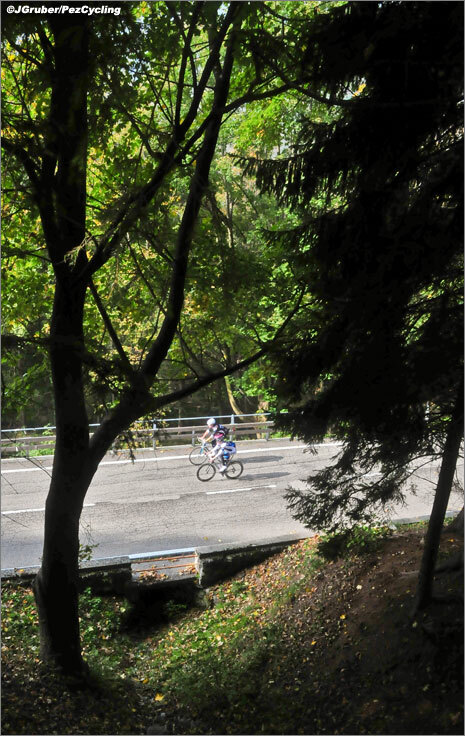 For 2010, the organizers of the Giro di Lombardia threw the riders a bit of a curveball: they reintroduced a long slumbering climb to the route of the Race of the Falling Leaves, the Colma di Sormano. We checked it out today. Read on! 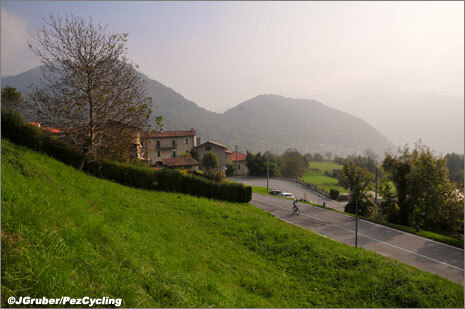 The Colmo di Sormano hasn't factored in the route of the Giro di Lombardia for many years, but in 2010, it will provide a very different finale than we've been used to in recent years. Ashley and I were happy to have a third member and a new friend in our little group today, Mr. Steve Holmes - whom we last saw riding the Mortirolo with the Pez himself at this year's Giro. Thanks for your patience and conversation, we had a great time! 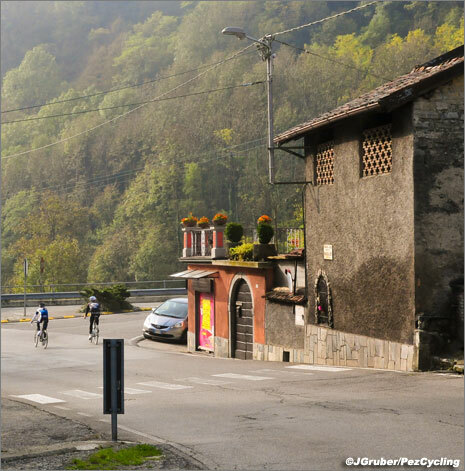 We started our day about a quarter of the way up the Madonna del Ghisallo after taking refuge last night at PEZ's favorite hotel, Il Perlo Panorama. Following three weeks of sleeping on floors, the big, comfortable accommodations at Il Perlo felt like a honeymoon. 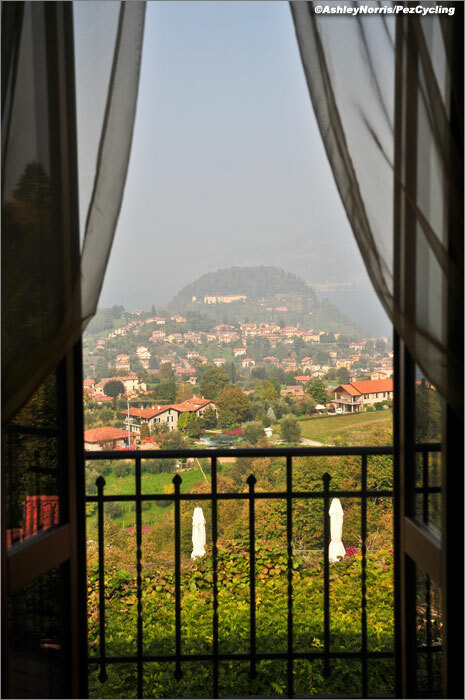 Il Perlo is situated in an absolutely ideal location if you're looking to ride the wonderful Lombardia roads, watch the race, and just enjoy the jaw-dropping views of the Lago di Como from your window. 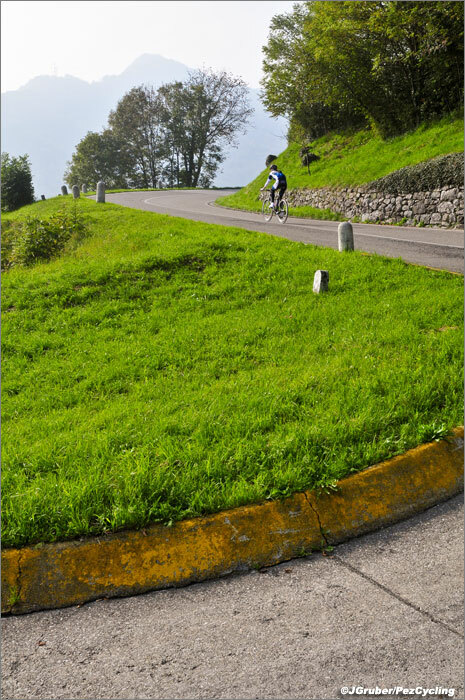 The right turn to begin the climb to the Colma di Sormano. 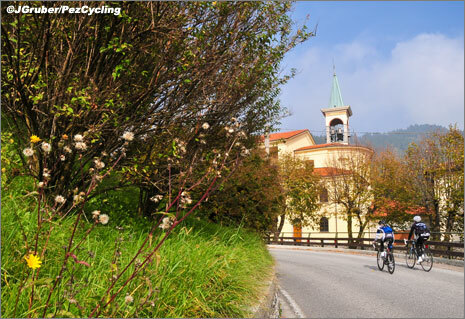 The race passes the legendary chapel at the top of the Ghisallo at 203 kilometers into the race. 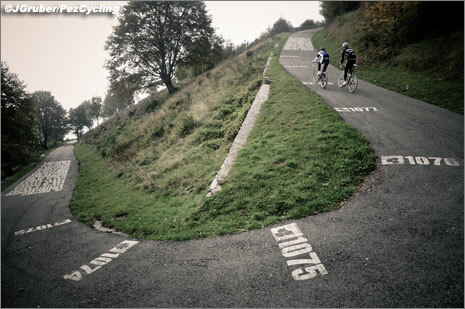 In recent years, racers took in a lengthy descent, some rolling terrain, and then finally, the Civiglio. 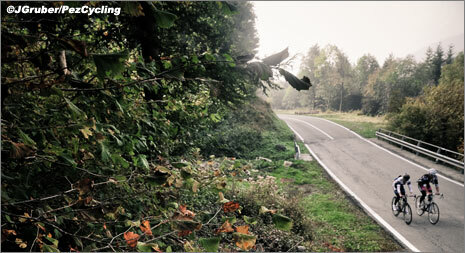 The Civiglio has been scrapped for 2010 though and replaced with the Sormano. 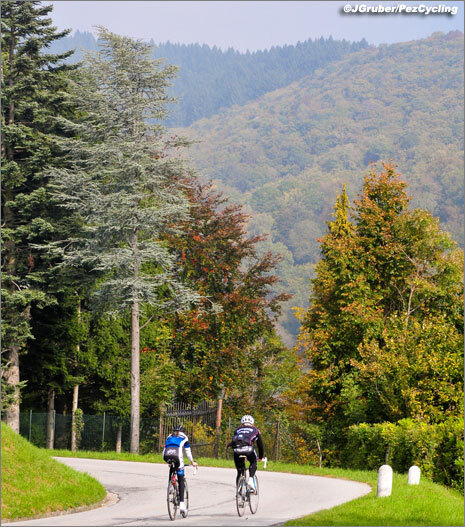 That means, the already Ghisallo weary riders will be hit in the face with the Sormano only SIX kilometers after summiting the Ghisallo. 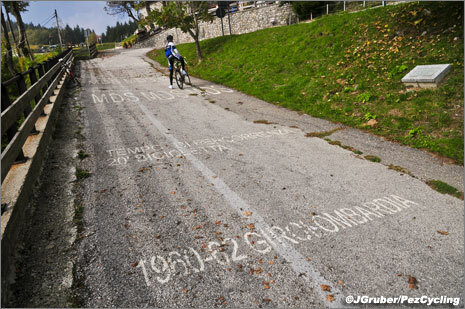 The climb goes from Kilometer 209 to Kilometer 219, making for 10 kilometers of all uphill racing. We ran into Cervelo's Xavier Tondo at the top of the climb today...when we asked him about his thoughts on the climb - "It's going to be tough - it comes after 210 kilometers! That's going to hurt." The question is though - is it going to hurt bad enough to get rid of the pure Classics riders like Philippe Gilbert or Alexandre Kolobnev. Tondo laughed: "Philippe Gilbert can climb very well. There were times during the Vuelta where he was going over climbs when there were only 20-25 riders left. He will be very strong on Saturday." 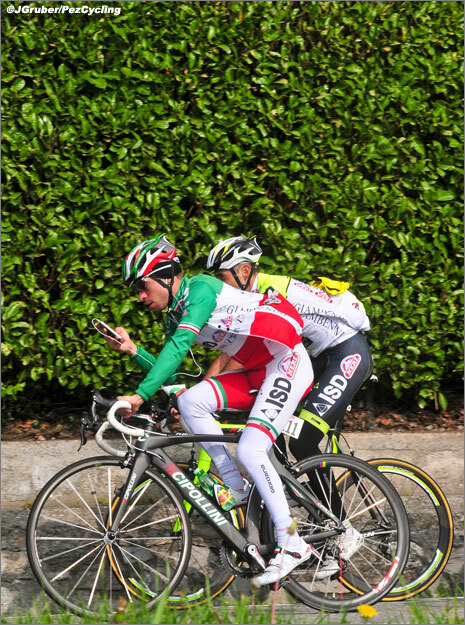 Long before we ran into a fantastically fun Xavier Tondo though, we ran into the team of the Italian National Champion, ISD-Neri, and the man himself clad in his tricolore kit, Giovanni Visconti. Visconti wasn't too perturbed about the new climb. He seemed a lot more interested in getting the right song on his iPhone 4. The lower slopes are relatively open and green. The views really open up in a few sections early on. The views are lovely, and the grade is equally so. 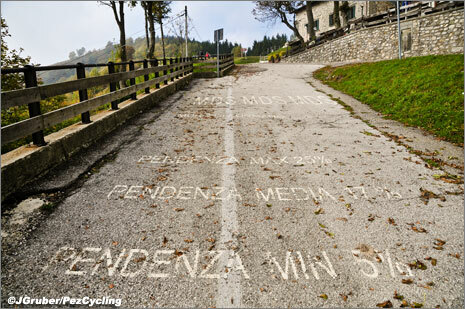 The Sormano is many things, but steep it is not. It is dotted with almost innumerable switchbacks and changes in scenery, but it never rears its head more than 10%, and generally stays tied firmly in the 5-6% range. 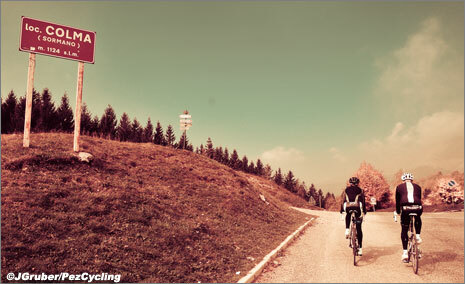 The climb starts at an elevation of 495 meters and ascends to a noteworthy 1124 meters, making for just a bit more than 600 meters of gain. 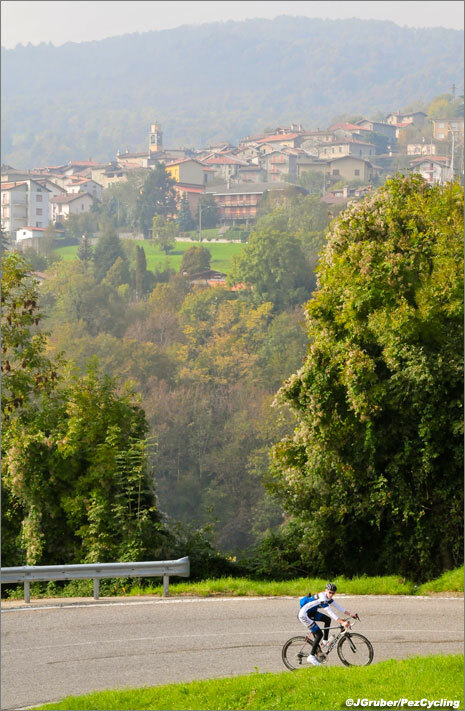 The town of Mudronno (Asso - haha), comes a little more than 100 meters of uphill into the climb. Still a long way to go. 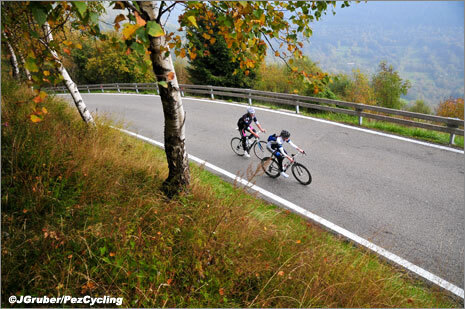 The climb is perfectly divided into two: 300 meters in the first half, 300 meters in the second half, and the halfway point of the climb comes at its namesake, the town of Sormano. 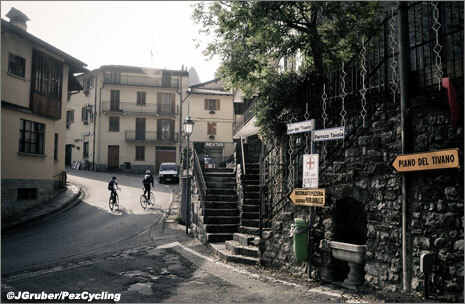 From what we could tell, the steepest part of the climb is in Sormano proper. It was here, that the Katusha team rolled up on us with Alexandre Kolobnev leading the way. We partook in their pace that was significantly quicker than ISD's (and ours), exchanged ciao's stole some pictures, and bid them adieu and good luck. 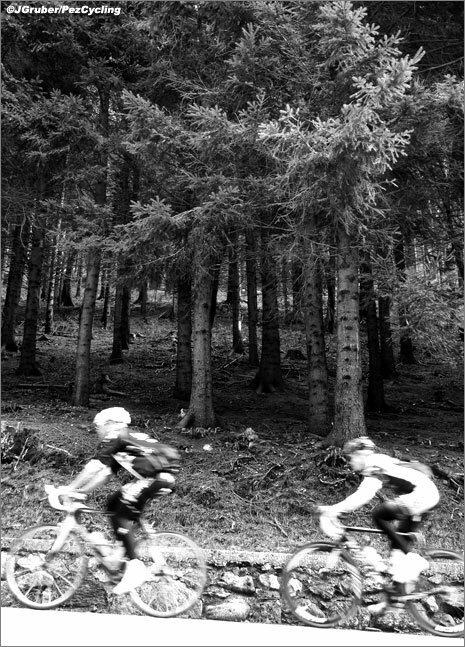 Soon after Sormano, the climb heads into dense forest for a kilometer or so. It's a beautiful section of road. Soon though, you emerge into the upper part of the climb, the switchbacks are over, and the peeks and glimpses you get through the trees are stunning. 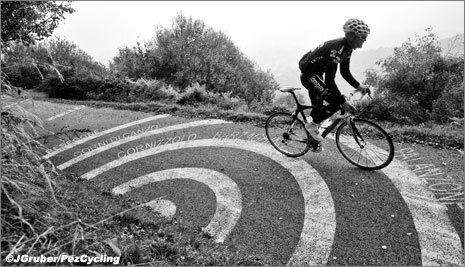 Before we get to the top though, we would be remiss to write about the Sormano without mentioning its brutal, demanding, misfit stepchild - the Muro di Sormano. The Muro is an alternative way up the climb, which chops off most of the second half of the climb in exchange for a little over a kilometer of road. What does that mean, you ask? Well, that's a 17% average with a maximum of 25%. Steve Holmes takes a break on the Star Wars like text that tells the sordid history of the Muro. 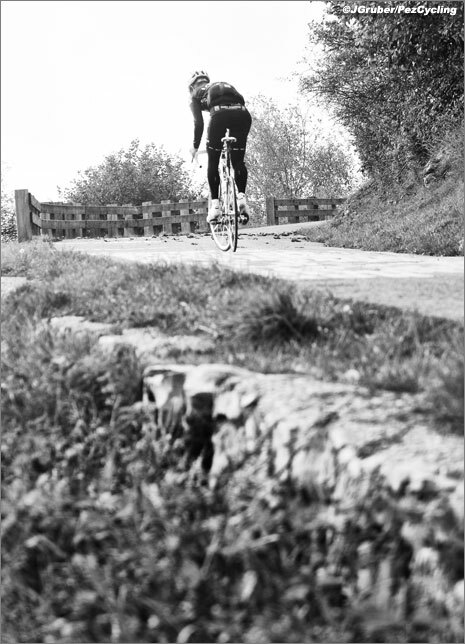 It was used in the 1960-1962 editions of the Giro di Lombardia. Ashley reports that the gear used to tame this terrible monster was a 42x26. Don't quote her on that though, there were a lot of words we didn't understand. Unfortunately, the organizers of the present are seemingly not keen on including the Muro and have left it out of this year's edition. Maybe these are baby steps though - first include the Sormano proper, THEN add in the Muro? We can only hope. 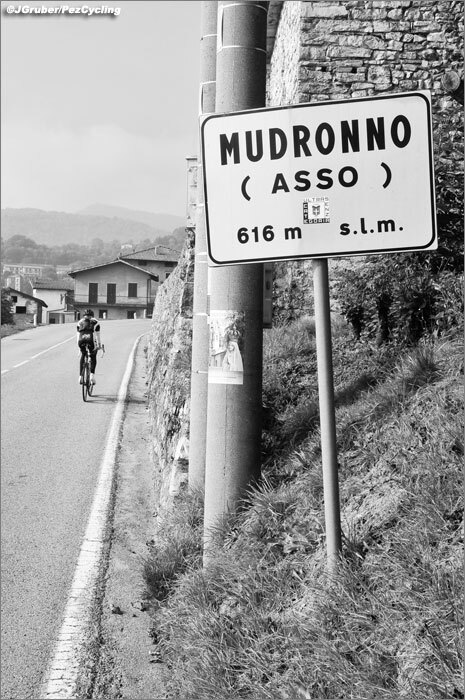 The Muro would make for an absolutely decisive point in the Giro di Lombardia. We didn't make up the stats. They're painted on the road. See, I told you, 1960-1962. 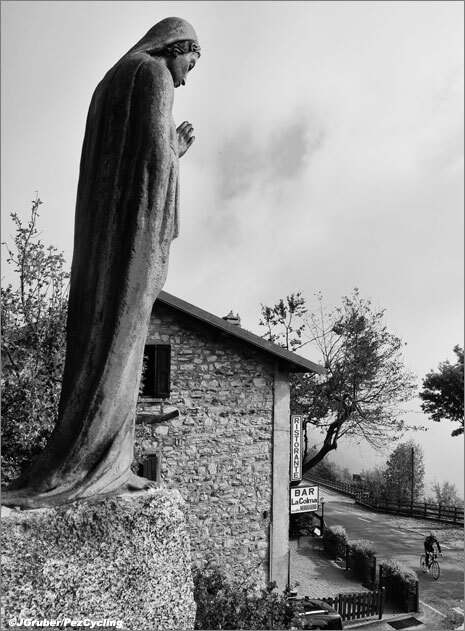 The top of the Colma di Sormano is a quiet affair with a small chapel, a tiny observatory, and a statue of the Madonna della Colma bowing her head solemnly over all those who pass. 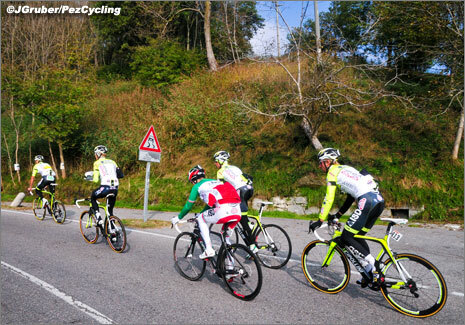 We spotted a fast moving Xavier Tondo at the top of the Sormano. He turned around as he crossed the top and struck up a conversation with Ashley, who was admiring the views of the mountains spread before us. Tondo just arrived in Lombardia. 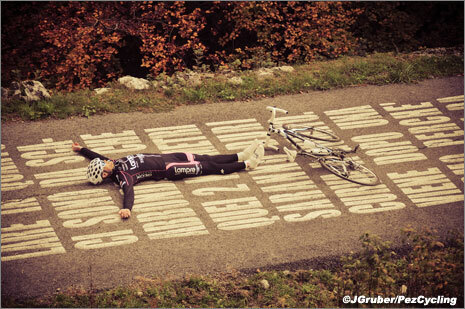 Only yesterday, he was riding in his hometown of Girona. He says he's feeling strong and ready for one last big race this season - a year that has been nothing short of spectacular for the rider from Catalunya. His recent 6th place overall at the Vuelta a Espana capped off a breakout season, his first on a major professional team. Next year, he'll join the ranks of Eusebio Unzue's Movistar team. As for Tondo and Ashley? 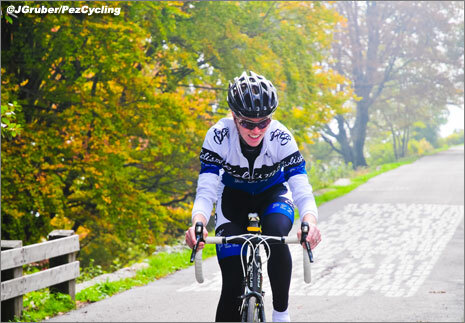 They both agree: they love their Zipp 404's and their Cycleops Joule 2.0's. Tondo spoke impressive English, especially for a guy who spoke very little before this season. We had a great conversation, but it was unfortunately cut short by the cries of his waiting teammates: Tondo! Tondo! Let's GO! 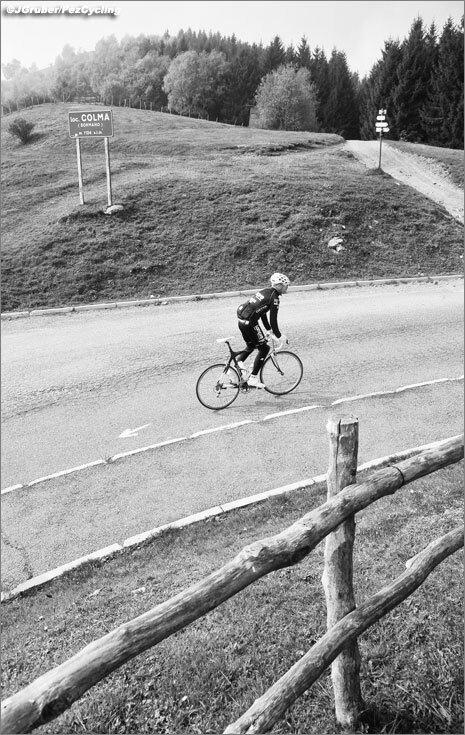 I think the climb will continue the work of the Ghisallo, but I doubt it will see the winning move go clear. 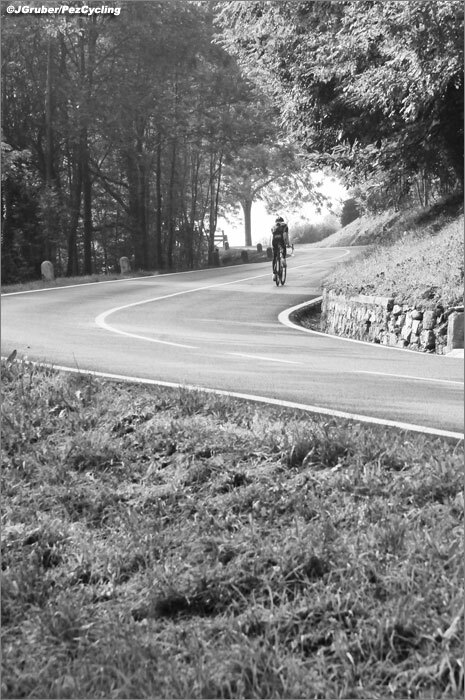 The long descent followed by 20 kilometers of rolling lakeside road to Como before the final climb of the San Fermo should see a regrouping, in my opinion, if any splits occur. Then again, if one of the big motors makes a big move and a small group pulls clear of the heavy hitters, it would seem likely that that will be the move. Of course that would seem likely, that makes sense, doesn't it? The question is whether the big guns will open fire on the Sormano though. 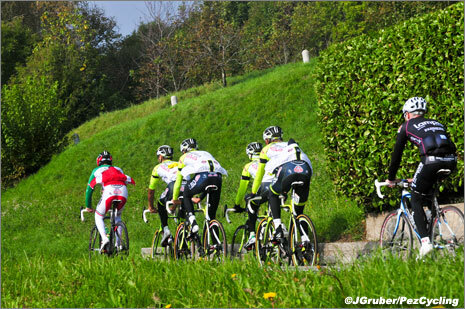 My inclination is that they won't, and the Sormano will serve to weaken and soften the lesser riders's legs. Of course, I can be wrong. I'm often wrong. I'll likely be wrong. 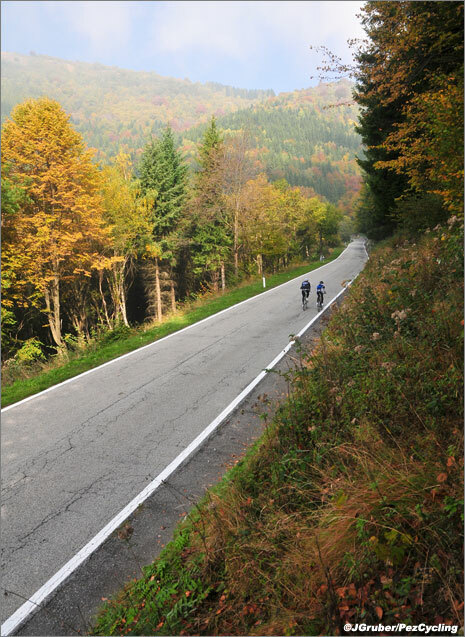 My point is, that by itself, the Sormano isn't nearly as hard as the Ghisallo, but coming only moments after the Ghisallo and taking probably another 25-30 minutes? It's going to tickle something fierce. 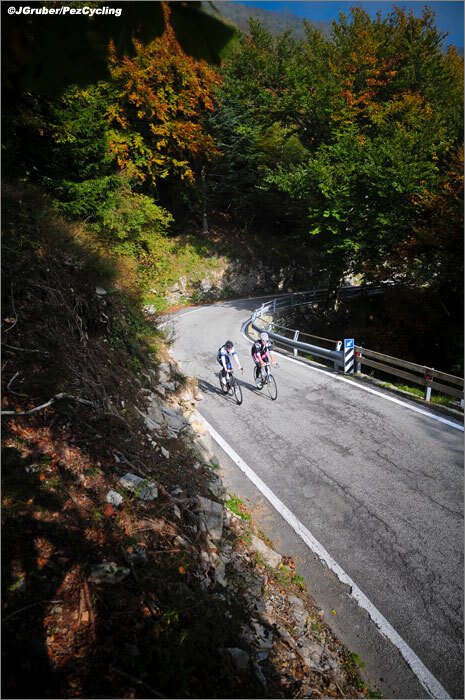 After the fun of climbing the Sormano, there was nothing left to do but try out the descent. THAT was a story all by itself. Check back in about a little while for the story of the descent. At the moment though, we are enjoying the expansive views offered by the fantastic Il Perlo Panorama. It really is incredible to look out your window and see this view. It's a dream. For lots more, check out all of our pictures from today over on our Flickr page. Be patient though, it will be a little while before we get all of them uploaded.